Even if the disc's title wasn't known, the attentive listener would be very conscious of air, both as a surrounding factor and with regard to its passage through wooden tubes and pipes. The "flutes" in question are recorders, played by Ruth Walser and tuned to various pitches, their "windways" (a wonderful word which I don't think I've ever before encountered) custom made by Geri Bollinger. 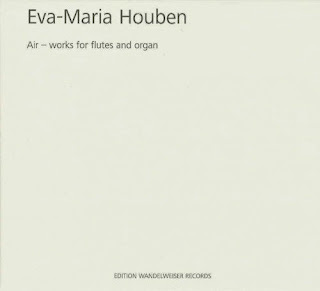 Houben presents three works on this recording, two for flutes/recorders and organ, one for solo recorders. "ein schlummer (a slumber)" (2013) finds Barbara Müller-Hämmerli on church organ accompanying Walser. The interior space itself seems to rumble at the start, before the instrumental lines enter, long, shifting notes from the keyboard and, as elsewhere on the disc, a very shakuhachi-influenced recorder style with many serenely bent notes and a contemplative, even slightly forlorn feeling. The writing is both intensely melodic and very "loose" in the sense of expansiveness and non-containment within themes (again, like much shakuhachi playing). Three recorders are used, a tenor and two basses, and their sounds, while often enough residing in the upper registers of the instruments, carry a fine, dark and wooden tone, beautifully set against equally wide-ranging pitches from the organ. "aufhören (coming to an end)" (2013) is written for the same three recorders and is a stunning work. Possibly extra effective hearing it after "ein schlummer" in that the recorder is heard very much alone, without the comforting "bed" provided by the organ. The notes sound a little more questing, curious, peering into the darkness. Some of the downward decays are like a fading candlelight disappearing down an unlit corridor. Very pure, very open; soft but forthright when needed, full tones but surrounded by whispers of blown air. Hard to say more about it except to marvel at its clarity and how deeply moving it is. 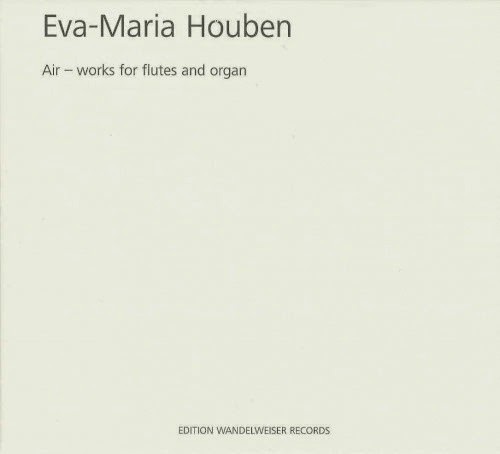 "Atmen V (breathing V)" (2014) finds Houben herself at the organ (this one in Germany, the other was in Switzerland), Walser covering five different recorders over the course of the piece's three movements, from F"-sopranino to F-subbass. The organ, in the first section, is quite respiratory, producing both steady, low rales and mid-register wheezes, the recorder floating above, its lines peaceful once again, though shorter. An amazing low, hollow tone billows forth a few minutes in, I assume from the organ but it sounds, not so human, more animal, like a moan from a large sea mammal, welling up through the wind. The second portion is perhaps even more hesitant, the organ breathier throughout (or is that just the ambience breathing? ), the recorder, high-pitched, sounding somewhat fearful. Lastly, the subbass recorder is heard, puddling through the vast space, winds circulating above. It sounds almost lost until its higher cousin appears, confident but thoughtful, glorious in its melodicism, leading us, if not into the light, into a place slightly less dark, only to receive more cautionary notes from below, eerily offset with keening, birdlike calls from the organ. A great set of pieces. "Air" is yet another utterly impressive offering from, in my opinion, one of the most consistently extraordinary composers at work today, one who continues to unveil new facets of her persona. Hear it. Off on holiday to England, back in a week or so.